SIFMA is the voice of the nation’s securities industry, bringing together the shared interests of hundreds of broker-dealers, investment banks and asset managers. We advocate for effective and resilient capital markets. SIFMA is the leading trade association for broker-dealers, investment banks and asset managers operating in the U.S. and global capital markets. On behalf of our industry’s nearly 1 million employees, we advocate on legislation, regulation and business policy, affecting retail and institutional investors, equity and fixed income markets and related products and services. We serve as an industry coordinating body to promote fair and orderly markets, informed regulatory compliance, and efficient market operations and resiliency. We also provide a forum for industry policy and professional development. SIFMA, with offices in New York and Washington, D.C., is the U.S. regional member of the Global Financial Markets Association (GFMA). SIFMA exists to advocate that America’s capital markets operate effectively and efficiently, to the benefit of all market participants. The combined businesses of SIFMA’s members represent 75% of the U.S. broker-dealer sector by revenue and 50% of the asset management sector by assets under management. SIFMA is a 501(c)(6) organization. Together, we are invested in America. SIFMA's origins go back to 1912 with the founding of the Investment Bankers Association of America (IBA). 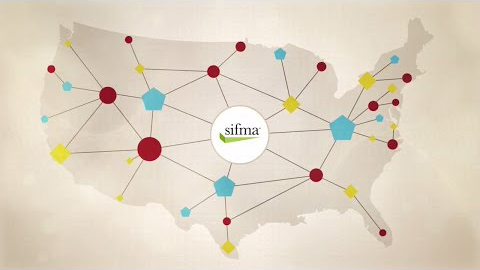 Today, after the merger of multiple organizations in our 100+ year history, SIFMA represents the broker-dealers, investment banks and asset managers who provide access to the capital markets. SIFMA convenes hundreds of broker-dealers, investment banks and asset managers, representing one million industry employees across the nation. Together, we are invested in America, serving clients large and small. This report contains our insights into market performance, viewpoints on critical policy issues and several helpful resources. Each fall, SIFMA’s Annual Meeting gathers senior industry executive in Washington, D.C. for candid one-on-one conversations and in-depth breakout sessions on the future of our capital markets. Mark your calendar to join us at the JW Marriott, Washington DC on Nov. 18-20, 2018.